when a preschooler’s mama has traveled to haiti, it provides the perfect opportunity to hear what kids know. just like the public service announcements on pbs cautioning parents in terms of children seeing too many images of the destruction of haiti, i hesitate to burst bubbles of protection that parents have created. 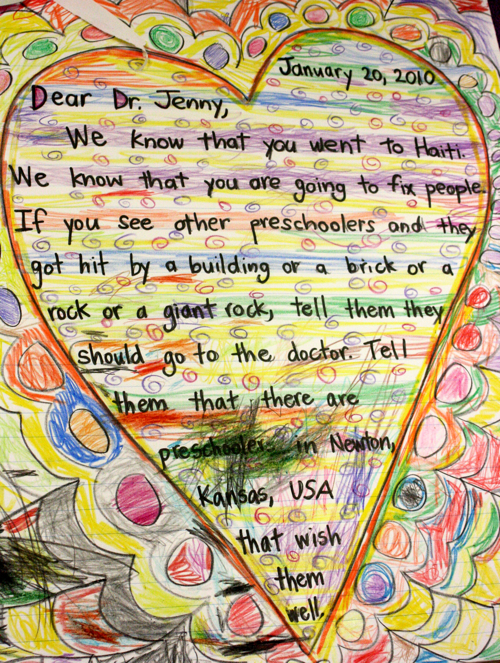 but in vague enough terms with plenty of compassion, preschoolers shared what they knew about the devastation in haiti. 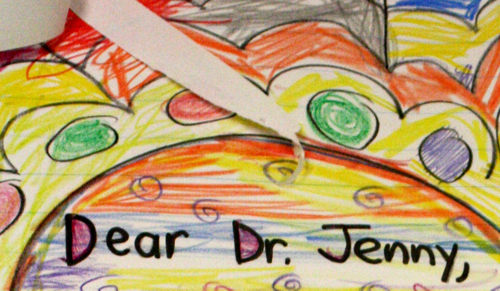 and dr. jenny, we wish you well as you travel home. thank you for sharing your gifts with the world. How sweet! You are such a great teacher that can make all of this understandable for kids who are so young. i love the letter and it’s so colorful. Seriously? Newton, Ks? Your wonderful, progressive, engaging preschool is in Newton? I’m amazed. I grew up in Great Bend, for the record.